Many art collectors and viewers are quite familiar with the concept of writing about a painting in terms of analysis, and fitting a certain painting into an art historical context. Writing in the painting is an entirely different modality and not often fully appreciated outside art circles, poets and writers in general, and those who are text heavy in their overall thinking. The use of writing or text in painting goes back to at least Egyptian and Sumerian and Greek works of 5,000 years ago and those writings were often used to help tell the story of a particular battle, to praise a fallen leader…or discuss the death of a dynasty. Picasso began to pick up on text and the use of words in his paintings in the early part of the twentieth century as a way to bring the outside world inside to the world of art making. In truth, there really is no Inside and Outside. There is only continuously flowing space. This space is separated through architecture and engineering into seeming “inside and outside“ spaces but space is continuous. You only need to leave our little blue spinning planet for a few minutes to realize this. Space goes on forever and then some. 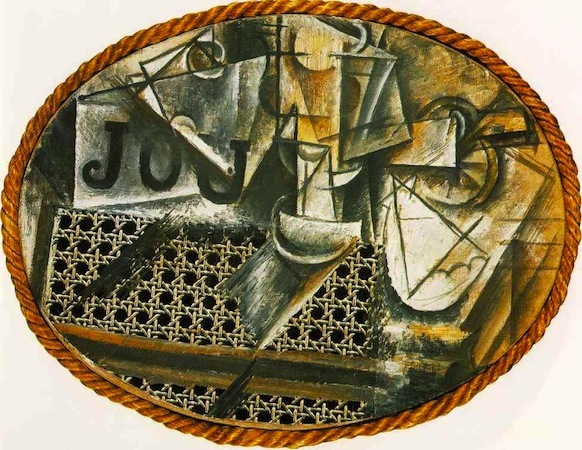 When Picasso introduced words into his paintings, often through clipping sections of Fre nch journals and periodicals and pasting them into his early cubist works, he was quite physically bringing the outside world into his work, shocking the viewer into an awareness of the connectedness between inside and outside. Picasso used the text in a nearly abstract fashion. The content of the words introduced was of less importance than the visual cacophony of seeing text next to brushstrokes and painted pattern. The text may have been pasted upside down or sideways; Picasso was fascinated by the bite and grit of the text, less so the content. Cy Twombly, the great American abstract painter who moved to Rome early in his career, introduced writing or text into his work in a scribbled, nearly carefree, note taking fashion. Twombly was able to integrate words and phrases scribbled across the surface of his works in such a way as to look nearly effortless. Unlike Picasso he did not clip bits of text, but rather wrote freehand. Words and phrases seem to come from memory and dreams, not a mission statement or close to it. More recently Richard Prince uses text in an abstract and highly humorous fashion, printing jokes and one-liners on top of beautifully painted grounds that barely relate if at all to the text he places on top. High art meets low art in a way that makes us laugh. I have used text on a very few occasions, though am not opposed to it. It seems to happen when it happens. When I did a dark charcoal grey painting called The Disappointed Mistress in 1992 in New York, I wrote the words The Disappointed Mistress on the bottom of the piece upon completion. I had not intended to write anything. The title arrived like a gift from above and beyond. 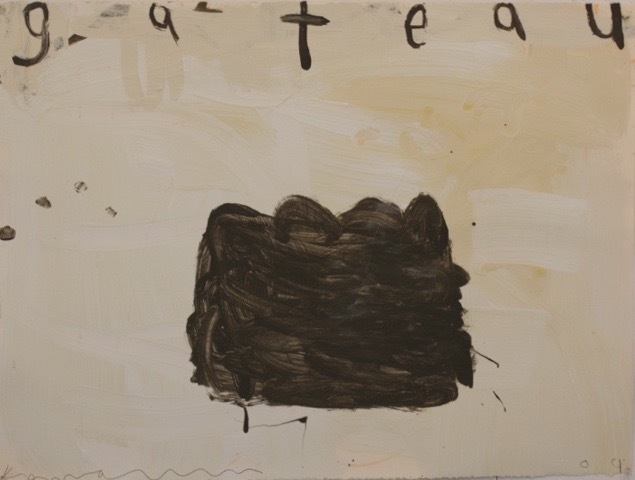 In the Komarin cake paintings, I do write Cake or Gateau on top of some of the pieces, freely drawn I attempt to write these words as child might, loosely, with little thought and written as though for the very first time. Like an 8 year old. Which is a good place to be. Words meet image in a Komarin cake. 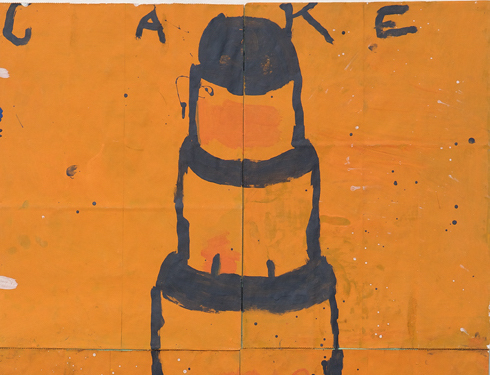 A freely painted cake, dripping here and there, freely brushed, unpredictable in its height and breadth, needs no text to complete it but is happy nevertheless to have the word sitting high above the image.